I should call this week Hawker Food Blog Week. With the rains, it has been making it terribly difficult for me to go shopping for food. Lugging the groceries home in the rain is a challenge better suited to the non-klutzy. Anyway, it shouldn't be that hard to get beef noodles in a predominantly Chinese enclave, should it? Wrong! I've noticed something odd about my neighbourhood since I moved here. There are no beef stalls at the wet markets. There are no food stalls selling beef anywhere in the vicnity! I'm very mystified and have pondered over this. I've come to the conclusion that it is because this is a predominantly Chinese enclave that there is no beef to be had. Most Chinese in Singapore are Buddhists and so they abstain from beef. Even the lone Indian butcher at the wet market does not sell beef, even though he is Indian Catholic, out of respect to the Indian Hindus who frequent his stall. Sigh. But I had a terrible craving today. The words "Where's the beef?" were ringing in my head all day. And I have a craving for Hong Kong beef noodles. Finally, I decided I would go to my usual Chinese food stall that sells a variety of dishes in the style of the Hong Kong restaurants. I was crossing my fingers that they would sell beef. And they did! The nice stall owner looked surprised when I asked for beef noodles, Hong Kong style. However, they only sold dry beef hor fun. 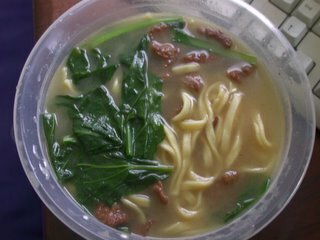 But I really, really craved beef noodle soup so I convinced him to make me some. I could sense his discomfiture as he told his chefs to make me some beef noodles soup. It appears that if they are not used to cooking a particular food item, they would usually not cook it. But because he made a special request, they had to and they did not look too pleased. So I gave them a particularly sweet smile, a wiggly wave of the hands and a sheepishly, pleading look to mollify them. Back at home, I opened my loot with relish. Sigh. They made the beef noodles with the flat, yellow noodles that the Chinese seem to love. Which I am not fond of at all! But in their aim to please by cooking what they thought was Hong Kong style beef noodles, they use the popular noodles Singaporean Chinese adore. I seem to be slightly allergic to Chinese yellow noodles, especially the big fat cyclindrical ones with lots of yeast in them. Or at least I think it is yeast. Well, there's something in them that makes me ill and unable to eat for days after that. I usually avoid them like the plague. Perhaps because they never seem to cook them long enough too that my body just cannot battle all that uncooked yeast. Anyway, these flat yellow noodles do not have as much yeast it them so I was not sick but they had that typical Chinese yellow noodles taste that, to me, is terribly unappetising. It ruined the dish for me, emitting a slimey, chalky milk taste that overpowered the broth and the taste of the beef. Thank God they gave me chillies. I drowned the noodles with chillies to disguise the taste. It did not work. Typical Chinese style, the chillies are the pickled green chillies. Tart and with as much spiciness as a soused capsicum, once they were in the broth, they were as tasty as styrofoam chips. It was all horribly disappointing. But worse, I knew there would be some people who would find this dish tasty. People who like Chinese yellow noodles. And tasteless chillies. Sigh. Maybe to console myself, I will make myself some nice hot chocolate tonight before bed. eh maybe you are allergic to gluten. lots of people are. suspect i am too cos big fat yellow noodles give me tummy upset for days. Really? But I eat other noodles and I'm fine .. and they have glutens too. Don't they?